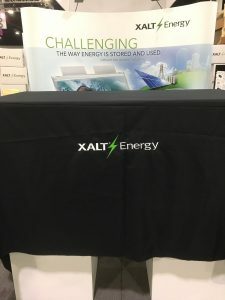 American Public Transportation Association (APTA) EXPO 2017, Atlanta, October 9, 2017 – XALT Energy, a leading U.S. manufacturer of lithium-ion cells and battery systems, announced today the second-generation (Gen II) battery cell to its portfolio of lithium-ion cells. The 65Ah ultra-high energy (UHE) cell uses Gen II technology, delivers 223 watt-hours per kilogram (Wh/kg) of high-energy, maintains a high cycle life and delivers 47 percent more energy density compared to the first-generation (Gen I) technology. The 65Ah UHE cell has a strong cycle and calendar life when compared to similar cells on the market while maintaining reliability, consistent high-quality and robust technology that are hallmarks of XALT Energy’s solutions. It is ideal for high-energy density applications where space and weight are limiting factors, such as in hybrid and fully electric vehicles, grid storage, and electric marine vessels and locomotives. “Our Gen II cell delivers a significantly higher energy density cell at a reduced cost without sacrificing battery cycle life. Based on market demands, our team has worked intensively on this technology to bring it to market in less than 18 months,” said Lisa Stevenson, director of cell development for XALT Energy. To learn more about the benefits of XMOD114E and other XALT Energy solutions, please stop by booth #6423 at APTA EXPO 2017. For sales, please contact us.